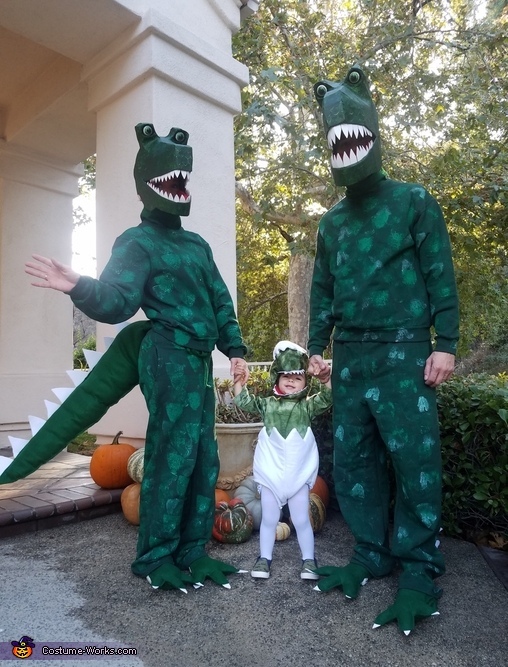 I made costumes for my husband and I to be a family of Dino's to go with our daughters costume. I purchases sweats online then blotted them with fabric paint for a texture Dino look. I then took cardboard boxes, cut, molded, and shaped the Dino heads. After I have a skeleton I took masking tape for the overall shape, then finished the look with scale shaped tape cutouts. I finished by painting with acrylic over the heads, cutting foam for teeth, and adding red felt for the mouth. The eyes were a great find at a craft store tat where actually mason jar tops that I glued in. The tail, feet, and hands are all felt with foam. I didn't sew I used a hot glue gun! Thank you for viewing!